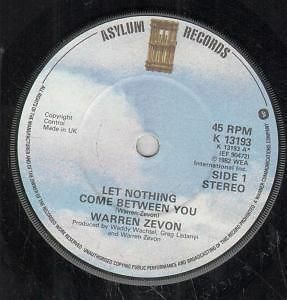 Desert Island Singles: “Let Nothing Come Between You” by Warren Zevon (1982) | Name-Brand Ketchup. ← Humble apprenticeship. So true. By now you may have figured out that I’m a big fan of the late Warren Zevon, easily one of the most brilliant and personal songwriters of the late 20th century. Though cynical, literate, and jaded, he turned out two of my favorite love songs: “Searching For A Heart,” and this one. Quite out of character, it would appear, but not really. This song appeared on Zevon’s 1982 LP “The Envoy.” Though it was easily as brilliant as the rest of his work, the geniuses at Asylum Records weren’t 100% in love with the sales numbers and in 1983 decided to scrap his contract. Zevon only found this out by reading it later in the “Random Notes” column of Rolling Stone. This allegedly sent him into a tailspin of alcohol and drug abuse, and in 1984 he checked himself into a rehab facility. He didn’t return to recording for three more years. The two guitar riffs are magnetic; everything sticks to them. The boxy drum rhythm holds everything together. The vocal counter-melody brings a celebratory feel. If an anvil should ever drop out of the sky onto my head, and I should ever marry again, this song will be performed at my wedding as a sing-along. C’mon, who wouldn’t sing “De de de de de, de de de de de” at a wedding? Oh yeah. Let no-one doubt the broad talents of the late, great Mr. Zevon. I had the pleasure of getting him to chant the de-de-de’s to me backstage after a show. Brilliant selection. Oh man, Robert, I’m in awe of that.